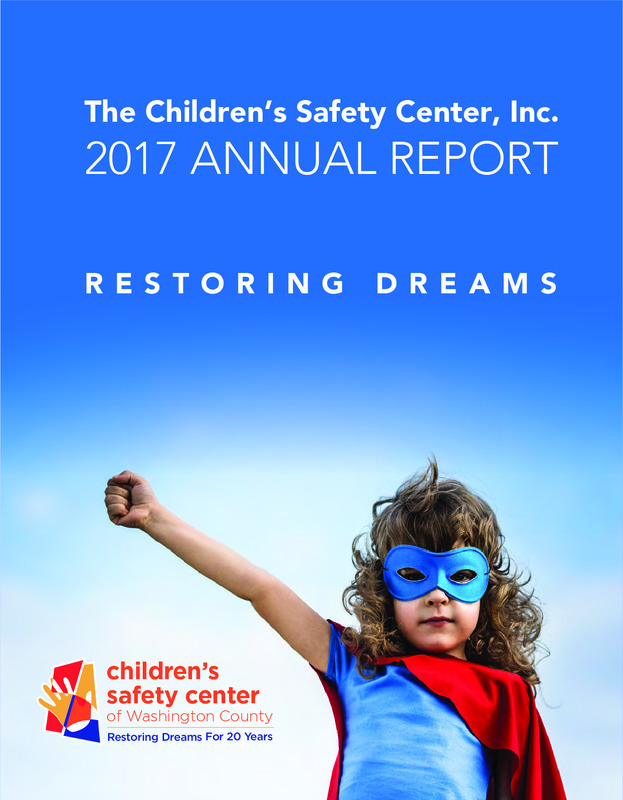 Thank you for being a 2017 supporter of the Children’s Safety Center. Whether it was a financial and/or in-kind contribution or you attended and may have volunteered for any of our CSC events, the team would not have been able to provide services, all while encouraging hope and healing to our clients and their families without you and your trust and investment. The following are several ways (statistics and client feedback) you made a direct impact on the Children’s Safety Center. We were able to hire a fourth child advocate. 679 alleged victims of child abuse were offered support by the CSC team. 146 alleged victims of child abuse had their forensic medical exams at the CSC. 594 alleged victims of child abuse had their forensic interviews at the CSC. There were 87 new CSC therapy clients and 687 therapy sessions were held at the CSC. The CSC’s prevention education program provided free training to more than 630 individuals in the community. The trainings varied from Mandated Reporter Training, to a school-based curriculum Empower Me!, as well as an evidence based program Stewards of Children. Through fundraising events, grants, individual donors, and funds through the state the CSC raised more than $640,000. "The way the situation was kept light and fun for the kids. They didn't make it scary or intimidating." "How nice and understanding they all are about our situation. It was very clean and the staff was very patient with my daughter." "The staff was very concerned about us and professional and helpful in a very difficult time." "Me and my daughter both are very proud of your staff and what you are doing for the victims of child abuse. We are lucky to have a place like this in our community. God Bless you all and your organization." During 2017, the team enjoyed celebrating 20 years and being able to learn even more about the history of the first and oldest Child Advocacy Center in Arkansas. Thank you for being a part of our CSC family. We hope you will continue supporting the CSC and the children we help as April is almost upon us and we have seen an increase in clients comparing 2017 to 2018.